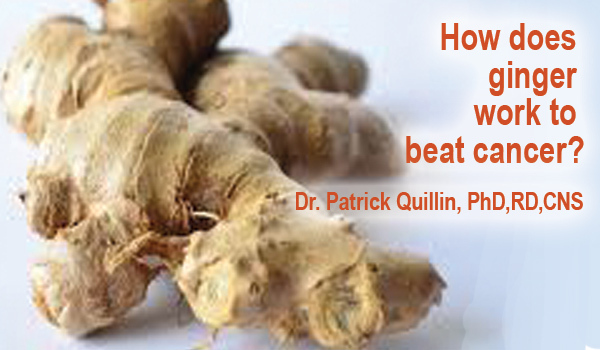 How Fresh Ginger Defeats Cancer Cells? You probably use ginger in some of your recipes, but do you know that ginger is more than food or spice? Ginger is an aromatic and spicy rhizome that is a darling of Asian cuisine used in many types of dishes including stir fries. The underground stem has a brownish skin and yellow or whitish flesh depending on the variety. However, ginger is not exclusively consumed in food. In fact, this tuber has been put to therapeutic use for thousands of years for various conditions including indigestion, colds, arthritis, headaches, swelling and cardiovascular problems. But in addition to these common ailments, ginger has been found to have great promise in fighting cancer. But how is this possible when effective treatment for cancer has proved to be so elusive? How can fresh ginger defeat cancer cells? Looks like although cancer is one of the most deadly diseases there is, it is not impossible to fight it. And if recent studies are anything to go by, food items like ginger could be the way to go in the fight against cancer. But before we look at the ingredients in ginger responsible for fighting cancer, we probably need to get some understanding of cancer. This popular kitchen vegetable could also help prevent cancer. Cancer is the name given to the condition in which some cells in the body get out of control and start dividing at a faster rate than normal. The result is that these cells end up forming an abnormal growth of new alien tissue which should not be there. This growth is known as a tumor. Cancer has no specific single cause. However, studies have shown that some conditions in the body are conducive to the development of cancer. Some of these conditions include chronic inflammation and excess oxidation within body tissues. This can be caused by the foods, drinks and anything else that we ingest; exposure to chemicals and radiation. Abnormal growth that forms cancerous tumors occurs when cell DNA is damaged which causes the cells to divide at a faster rate than they should. This abnormal division does not occur in case only a small number of cells are damaged because the immune system can deal with these. However, when body cells are continuously exposed to irritation (chronic inflammation, oxidation, etc) the immune system cannot cope with destroying all the damaged cells. This leads to overgrowth of abnormal cells into tumors. The danger of cancerous tumors is that they keep spreading such that they interfere with the surrounding tissues and even spread to other parts of the body. The growth is possible because new blood vessels grow to supply the cancerous cells with blood. Besides, once the DNA is damaged, the cells are no longer programmed to die at some point. This is not the case with healthy cells which die off after a certain period of existence or once they are damaged. How can cancer be defeated? Having looked at what cancer is and how it arises and grows, it is apparent that it can be fought in two main ways: removing the causative irritant or fighting the irritation. Ginger works by preventing, reducing or stopping the inflammation or oxidation. Many studies indicate that ginger is effective in destroying cancerous cells in different types of cancer including skin cancer, pancreatic cancer, breast cancer, colon cancer, ovarian cancer, and lung cancer. Some of the studies even indicate that ginger could be more effective at beating cancer than chemotherapy. But how does it accomplish this? According to the studies, the compounds in ginger target the cancerous cells while leaving healthy cells unaffected. This is different for chemotherapy and radiotherapy treatments which destroy both cancerous and non-cancerous cells. Ginger contains many compounds including minerals like magnesium, potassium, zinc, calcium, iron, manganese and sodium; vitamins B1, B2, B3, B5, B6, C, E; phytochemicals like gingerols, paradols, shogaols. Collectively; these ingredients provide ginger with more than 40 beneficial health properties, including fighting inflammation, oxidation and cancer. These properties are both preventive and curative as indicated by studies like this one and this other one, which show that ginger extract inhibits and stops growth of cancerous cells by about 56 percent. A laboratory study at the University of Michigan Comprehensive Cancer Center, found that ginger can cause the death of cancer cells. Based on laboratory tests, researchers estimate that consuming 100 milligrams of ginger extract (approximately 100 grams of fresh ginger for a person of average weight) daily can offer effective treatment against cancer that can achieve about 56 percent reduction in cancer growth in case of prostate cancer. Ginger works by impairing reproduction of cancer cells and also induces death of the cells. This would mean that consuming ginger can offer some protection against cancer. It can also reduce or stop multiplication of cancerous cells. Add minced ginger to your plate of vegetables. Prepare a dressing using ginger, olive oil and garlic. Using ginger to make tea in the following way: add thin slices of ginger to hot water; let it stand for about 30 minutes, squeeze juice from slices of lemon into the tea, stir and drink. You may also add some honey if you like it sweet. Add fresh grated ginger to side dishes, etc. Many research studies conducted on the effects of ginger on cancer cells indicate that this humble rhizome has the ability to defeat cancer. Coupled with its long standing as an effective medicinal food, it is a good reason to consider making ginger a regular ingredient in your diet. Unlike conventional cancer treatments such as chemotherapy and radiation, compounds in ginger target the cancer cells while leaving healthy cells intact. It is also worth noting that besides being an anti-cancer agent, ginger has many other health benefits. Being a powerful anti-inflammatory and antioxidant, it helps in conditions like arthritis, Alzheimer’s disease, cardiovascular diseases, sore throat and heartburn among others. ← Do artifical sweeteners affect diabetes? Cancer-fighting foods are the most powerful way of healing from cancer and cancer prevention, Ginger is one of them, I have learned some good things from your article that I don’t know before. I have also a blog where I write about cancer-fighting food recipes.